Thank you for visiting our website! Whether you were sent here by a friend, or just happened across us — you may be at the beginning of a life changing experience involving camp — more below — on the beautiful New Hampshire shores of Lake Winnipesaukee. There are 195 acres of shoreline, beaches, woodland trails, and recreational facilities for all ages. Living quarters include a three-story inn (at left), cottages, cabins, and a small camping & RV area. Other facilities include a rustic chapel, large indoor areas for group assembly (or dance), a store, a health center and an outdoor chapel. Camp Winni is our fun n’ fabulous annual conference meeting of NNESRE (Northern New England School of Religious Education) which meets this year from Saturday August 3rd to Saturday August 10th, 2019 at the Geneva Point Conference Center — 108 Geneva Point Road, Moultonborough, NH 03254 — www.genevapoint.org. Living in community with your family, friends, and new-friends-to-you for a week provides an awesome opportunity for people of all ages to experience the fun of getting to know people in an intergenerational, interfaith (all faiths and non-believers) context. With the activities provided, you make connections with people in a variety of settings — connections of play, dance, discussions, workshops, campfires, music, etc. Imagine your favorite summer camp with around 300 friends of all ages and backgrounds! Ahhhhh, that is what makes us special. Our conference (referred to as the Northern New England School of Religious Education or NNESRE) has been meeting together as a group for 100 years. And for most of that time we have been meeting at “Winni” — Geneva Point Center — located on beautiful Lake Winnipesaukee in New Hampshire. Geneva Point Center is a conference center with a wide variety of housing options from tenting to cabins to motel-like rooms. 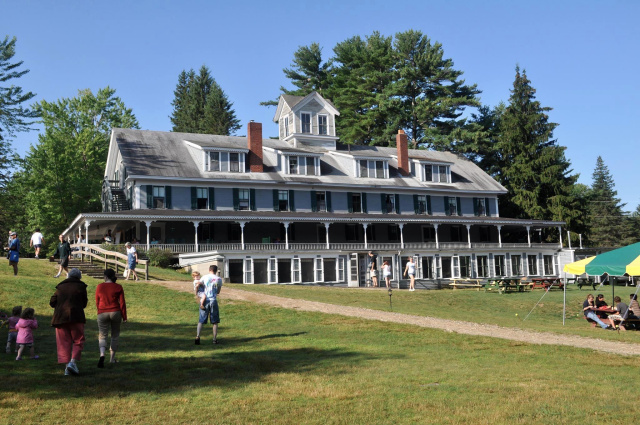 Meals are provided 3 times a day in a dining hall in an Inn and plentiful meeting and play spaces for our participants to enjoy — along with extensive woodlands and a beautiful beach on Lake Winnipesaukee. Our annual conference, which meets this year from August 3rd to Saturday August 10th, 2019 — is rich in traditions of fun, play, inclusion, spiritual exploration, and LOTS of campfires to sit your chair down and make a new friend. Although NNESRE began as a Christian Education conference — at Dartmouth College in New Hampshire — we have intentionally evolved over the years to become an interfaith conference, welcoming all beliefs in the appreciation that diversity builds understanding that strengthens both our community and the world. Activities are designed to engage people of all ages in a spirit of recreation and fun that deepens relationship and connection to one another. The days are full of opportunities, and yet there is complete freedom to do nothing — and, of course, no one needs to do the dishes. It builds memories of all kinds with campers often reporting milestone experiences. The week has become known as a place of exciting community — a place of re-charging oneself each year. Participants have begun as kids, continued as teens and adults, and grown to be new families returning each year. It is much more than just 300 people gathered together in the same place and time. Each year the camp is blessed with a multitude of musicians who offer their talents in a wide variety of contexts: Community Concert, Campfire Sing-A-Long (family and camp songs), Bonfire Sing-A-Long (contemporary folk and campfire music) and Drum Circle. We sing at meals, services, campfires, on the porch, by the water — wherever voices are gathered, music often follows. Our Hootenanny, and Coffee House, present opportunities for all campers to display their talents. Almost every night intergenerational Folk Dancing and fun spirited Games are offered in the Barn on the main campus. Activities are provided for all abilities, skills, and levels of embarrassment. Our leader extraordinaire, Ms. Barb Siftar, carries on the tradition that her parents established at Winni back in the 70’s. For many, this experience is the heart and soul of the conference as they re-experience the joy of play and the deep connection that dancing the final dance around a candle as a community can bring. A large green space in the heart of campus becomes the playground for people of all ages with ultimate Frisbee, football, throwing a baseball, playing table games on a picnic bench, sitting under the trees or star gazing at night. There is also a softball field for the annual camp softball game, a labrynth, and a volleyball court. The annual Winni-Swimmi is an open water ½ mile swim and often there are water front games led by the lifeguards. And of course, there are beautiful hiking paths on the property into the woods and around the water. We are big on fun for the sake of fun. Every morning at ½ past 8:00 we sing a song about a little boy named Georgie. Every Friday after dinner, we all gather for the annual Watermelon Seed Spitting Contest. As an annual conference in such a beautiful setting, it is hard for those attending Winni to not take stock of how their life has changed over the past year and the meaning they have drawn from that. Our Camp Chaplain organizes a Morning (7:30 am) and Evening Watch service each day where messages, experiences, and music are shared from a variety of contexts. It has been our tradition to offer a Communion, Labyrinth Walk, and Shabbat Celebration service during the week to those in our community. We welcome you to come take your place, share your faith, and be part of the spiritual journey at Winni. In addition, many of our Adult Education classes explore scriptural and religious texts to deepen our understanding. However, for many — being in the beauty of Winni — in the quiet of the woods or by the water on the shore — or the deep gaze into a campfire — provides the opportunity to connect with whatever holds meaning for you. And while Winni is a place of great joy, we also take time during the week for our Annual Memorial Service, where we remember the lives of friends lost during the past year. The Adult Education Program at Winni strives to provide a variety of classes to engage participants in exploring religious issues, political topics, and personal development/creative skills or hobbies. You can develop your water color technique during one period, talk scripture the next, and finish off your day discussing global issues. All classes are optional and are taught by campers who are part of the community. Perhaps you have a class you would like to teach? Parents can attend these classes as their children attend the Winni Ed. School Program. Children from infants to teens are provided with activities during the morning so parents can take a break and attend classes — or simply take a break and enjoy a cup of coffee. Basic to the camp experience is the ability to connect and speak with an old friend, make a new friend, and/or join a group that makes you feel like you are part of the community. At Winni, this happens in numerous settings: at meals, in classes, in recreation and play, sitting on the porch, and especially sitting around a fire. There are numerous fire pits around the Winni campus and at night they are lit with fire, conversation, and hospitality. Bring your own chair and beverage and be ready to settle in to discover a unique conversation and friendship.